Rabbinical Centre of Europe congratulates Hollande for winning election in France, alerts him of the resurgence of anti-Semitism. 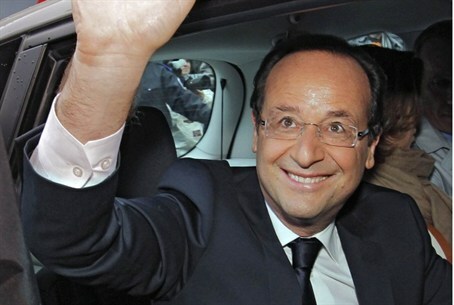 The Rabbinical Centre of Europe (RCE) congratulated Francois Hollande on his winning the presidential election in France, while alerting him of the resurgence of anti-Semitism and intolerance of religious freedom in the country. The RCE is an organization, dedicated to serving the needs of European Jewry, which represents over seven hundred rabbis and Jewish communities throughout the European continent. In a statement released on Sunday, RCE wrote, “We congratulate Francois Hollande upon his election as President of the French Republic, and wish him every success for the next five years. “We alert the president-elect on the resurgence of anti-Semitism and insecurity in Europe and France in particular and the need to vigorously fight it regardless of its origin,” the organization said. Most recently, a dialogue conducted by Israeli students in the University of Toulouse was disrupted by protests’ hateful threats and chants. The delegation of Israeli students from a non-political organization were midway through a tour of French universities and had held successful events in Lille and Lyon before visiting Le Mirail campus. They were at a stall on the campus and were handing out leaflets and speaking to students when a group of protesters arrived and began shouting at them through a megaphone. The president of the French Jewish student organization has called on the University of Toulouse to combat anti-Semitism following the incident. The incident, which occurred on April 25, came approximately one month following the murder of three Jewish children and a rabbi by an Islamic terrorist at the Otzar Hatorah school in Toulouse. In a separate incident eight days later, a student from the Otzar Hatorah campus in Paris was lightly injured in an attack by anti-Semites.